Early settlers brought seeds of soapwort to the U.S. from Europe. It was actively cultivated in gardens. 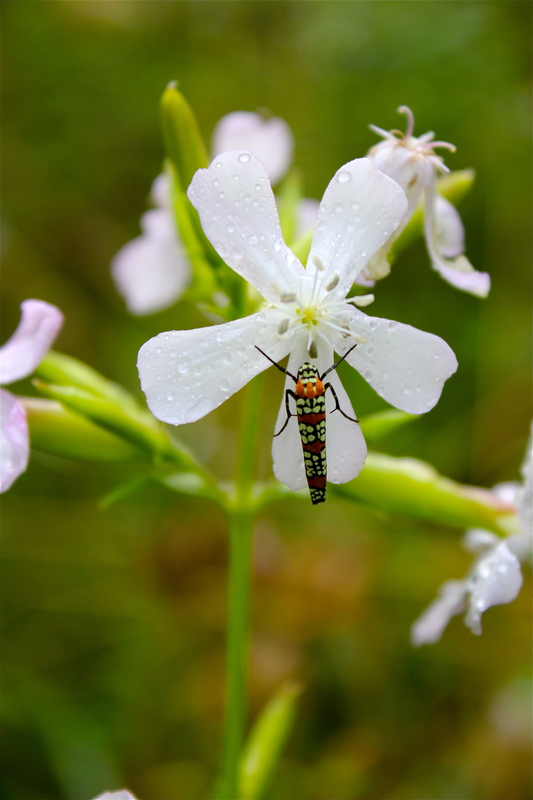 An extract made from the juice of the plant was used to create suds when washing clothes–hence the name soapwort. The plant was also called “Bouncing Bet”, after the old-timey name for a wash woman. From a chemical point of view, soapwort contains saponins–chemicals that make a soapy lather when mixed with water. The leaves of Bouncing Bet are opposite, elliptical, and sessile (they don’t have petioles). They can grow in size from 1 to 4 inches long. The 5-petaled flowers occur in clusters at the top of the plant; they range in color from white to pink. The flowers are particularly fragrant at night. The plants grow up to 2 feet tall and tend to occur in small colonies in sunny areas. Farmers beware: saponins are toxic when ingested, so generally speaking, animals should not be grazed on land that harbors a great deal of soapwort. The flowers pictured here were growing along a roadside in the Washington-Jefferson National Forest near Glen Alton in Giles County. Bloomtime for soapwort is July through September.